...... Detect your OS to indicate the best settings for your system. Adjusts MTU, MSS. Automatically detect the MTU for all networks along the path to a remote host, thus avoid packet fragmentation, performance problems. Detecting bad routers that may prevent MTU discovery procedure to be completed correctly. Adjusts RWIN to the best size settings for your system. Configure the TTL value that defines how long a packet can stay active before being discarded. Configure Keep Alive Time, Keep Alive Interval values to prevent your connection from being automatically disconnected after an ideal connection. Protect your system aganist SYN Flood attack. Protection aganist ICMP redirect attack. * Optimize Configuration of the register of Windows. * Optimize Configuration of the Files of Initialization. * Configure Buffer IRQ for PCI cards. Qweas is providing links to Internet Speed Up Lite 4.3.0.3 as a courtesy, and makes no representations regarding Internet Speed Up Lite or any other applications or any information related thereto. Any questions, complaints or claims regarding this application Internet Speed Up Lite 4.3.0.3 must be directed to the appropriate software vendor. 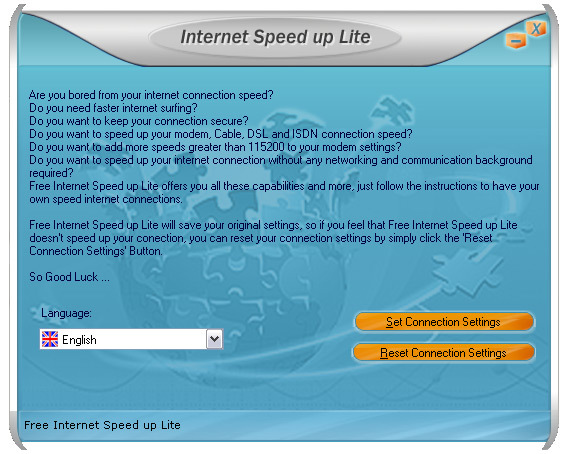 You may click the publisher link of Internet Speed Up Lite on the top of this page to get more details about the vendor.